Normally, I’d tackle this chapter by chapter but since I am fairly certain revisiting the text in such detail would only lead to self-mutilation, I will take the bird’s-eye view. Sandifer begins by discussing three would-be philosophers of dubious merit — Elizier Yudkowsky, Nick Land, and Mencius Moldbug AKA Curtis Yarvin — all of whom have in their way provided what passes for the philosophical underpinnings of the bigotry that now infects large swaths of the developed world. The Austrian School of Economics comes in for a deserved rib-kicking. After that, Sandifer edifies the reader with a tour of the ravings of David Icke, and such lowlifes as Gamergaters, TERFs, the demented Cheetoid currently occupying the White House, and of course the sadly rabid puppies. All of this seasoned with a light sprinkling of apocalyptic William Blake. In the course of her foray into modern fascism, Sandifer lists what she sees as the common factors motivating the individuals and movements involved (while at the same time drawing the reader’s attention to the fact that looking for common causes is often the first step towards conspiracy thinking and paranoia). While many of the figures involved would not regard the others mentioned in the book as allies, they’re all chipping away at the foundations of civilization. The drive to do so, she reasons, can be based on certain commonalities. I read this with interest the first night I tackled it. I made it halfway through. And then … I found that I was reluctant to start reading again. It was depressing, disgusting. It was a dive into the sewers of modern thought. But I did it. Reader, I finished it. I can’t say that I am happy that I managed to do so. I am not sure that a better understanding of these fools will make my life better. Perhaps more informed and certainly more depressed. Sandifer starts off with the premise “Let us assume that we are fucked” and she proves her point in more detail, on more levels, than I had expected. Readers looking for a cool, aloof scholarly study will want to look elsewhere. Sandifer’s approach is more akin to that of Hunter S. Thompson than to that of any academic. There is no pretense to neutrality here. Sandifer clearly sees the so-called alt-right as the vast constellation of morally bankrupt, philosophically broken grifters and dupes that it is. She never attempts to conceal her fury at the success of these idiots. This will no doubt disappoint those looking for a so-called balanced treatment. Me, I found it a welcome change from the punditry that regards monsters and fools as entitled to the same consideration as those they victimize. 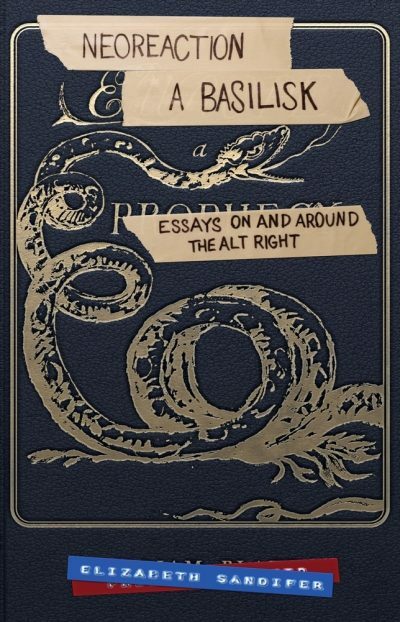 Neoreaction a Basilisk: Essays on and Around the Alt-Right is available here (Amazon) and here (Chapters-Indigo).